The Etzbah HaGalil, or Galilee Panhandle, is the northernmost part of Israel, a “finger” of land extending into Syria and Lebanon, with its southeastern border also touching on Jordan. Militarily and geopolitically vulnerable, Etzbah HaGalil is also far removed from any urban centres, rendering it somewhat cut off from Israel’s economic and cultural heartlands, as well as its government infrastructures. For all of these reasons, young people growing up in Kiryat Shmona, one of the Etzbah’s major towns, face particular challenges. Add to the above the fact that many immigrants are drawn to the Etzbah by cheaper housing. As in any other country, newcomers to Israel have a particular need for social services and community institutions to help them integrate into society and flourish. Yet those are the very things that have been hard to find in the Etzbah. Enter Beit Vancouver, a centre for youth at risk in Kiryat Shmona. Originally built by the British Jewish community campaign (United Jewish Israel Appeal) in the early 1980s and held by the Israeli Housing Ministry, the youth centre that would eventually become Beit Vancouver was built near a major public high school in Kiryat Shmona. Inadequate operating support left it deserted for many years and the centre was in need of rescue in 2004 when the Partnership2Gether Coast-to-Coast steering committee identified it as a high-priority project in the region. P2G is a partnership between Jewish Federation of Greater Vancouver and five other Jewish communities across Canada, and the steering committee includes representatives from the Canadian and Israeli communities in the partnership. In 2005, three Vancouver-based families (the Diamond, Heller and Libin families) visited the region and donated funds for the renovation and renewal of operations at the centre. Beit Vancouver was scheduled to open July 11, 2006, but that day turned out to be the first day of the Second Lebanon War, which delayed the centre’s opening until September 2006. The initial operating years of Beit Vancouver were strong, with rapid growth. An infusion of funds from the Israel Emergency Campaign beyond the initial commitments from the core funders helped. Juvenile delinquency dropped dramatically in the region and, in 2008, the centre was singled out for national recognition for excellence in providing services to youth. Unfortunately, 2009 saw both a reduction in funding and changes in staff that led to a decline in the centre’s effectiveness. A visit by Vancouver Federation staff in 2009 inspired a strong intervention with the city administration to force attention to the state of the program and building. 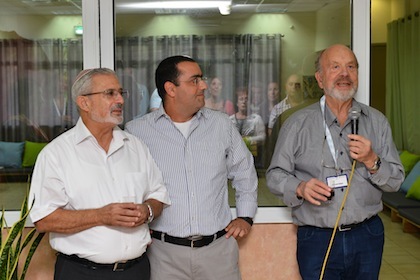 Three core partners – Vancouver Jewish Federation, Kiryat Shmona and the Rashi Foundation – each committed to a revitalization of Beit Vancouver, with ongoing operating funding at a sufficient level. The centre reopened in March 2010 and the level and quality of programming has grown steadily. When a financial crisis in Kiryat Shmona caused the closure of all other community centres in the city, Beit Vancouver stayed open, providing full-scale services to hundreds of youth on a daily basis. And, not only that, but the Beit Vancouver building has been used for emergency housing and relief for Israeli children in communities under attack. For example, when under fire from Gaza, children from Sderot were bused to Beit Vancouver. Federation currently funds three programs at Beit Vancouver: [email protected], Merkaz Ma’ase and Youth Futures. Krembo’s Wings is under review to be funded for 2017. [email protected] is an education program that helps high school students achieve high-level computer skills. The program has produced 5,000 graduates and is the only one of its kind in the region that integrates Muslim, Jewish and Christian youth in joint activities. Merkaz Ma’ase is a leadership program for young adults designed to deliver equal opportunities and social mobility. It engages at-risk youth in a year of volunteer service after they graduate high school and before they begin their army service. Youth Futures is a community-based intervention that aims to help children in junior high who are notably at risk for failure or withdrawal. Children are referred to Youth Futures by teachers, social workers and others who observe their need for help, shown by poor attendance, failing grades and behavioral problems. The child is paired with a trustee who acts as a bridge between the child, the family, the school and the public system. Lastly, Krembo’s Wings provides weekly social activities for young people living with any type of motor, cognitive or sensory disability. The program helps these children become part of community life. Shanken encourages Vancouver Jews to make Beit Vancouver part of their Israel trip. “Having a place that bears our name creates a bridge that can connect our communities,” he said. Vancouverites can designate donations for Beit Vancouver through the Federation’s annual campaign, which was launched last week. For more information, visit jewishvancouver.com.